nMind is a short adventure with arcade elements designed for the Google Cardboard. It's also playable without any special viewer. Game is totally free, if you enjoy it you are able to support our next big project InCELL (http://incell.nivalvr.com) via InApp purchases. InMind allows the player to experience the journey into the patient's brains in search of the neurons that cause mental disorder. Submerge into the microworld and experience the miracles of the human mind. 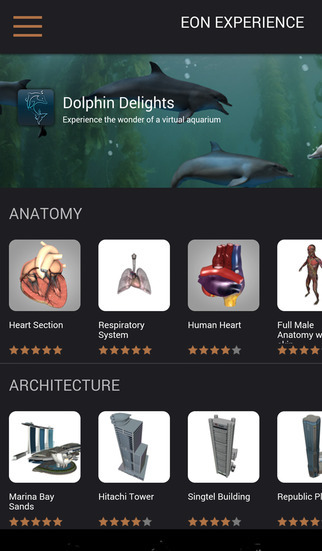 EON Experience VR is a service for viewing interactive Augmented Reality and Virtual Reality applications on your mobile device. The EON Experience VR application delivers an exceptional AR/VR experience anywhere, anytime.